Cosmo had a stroke last week. I look at these shocking words on the page and realize that I have been repeating this phrase over and over in my head ever since. I know he is nineteen and yes, he’s had a good life (isn’t that what they say to lighten the blow) and it was inevitable wasn’t it? Had to be something. Cancer or thrombosis or kidney failure. I can imagine cards drawn from a pile of death sentences? Roll the dice. One, two, three, four, five, six – “Oh! Landed on Reading Railroad.” Beware of falling under the tracks. “Do not pass GO!” – you have serious Alzheimers and don’t have a clue. We have loved and lived with fabulous cats. 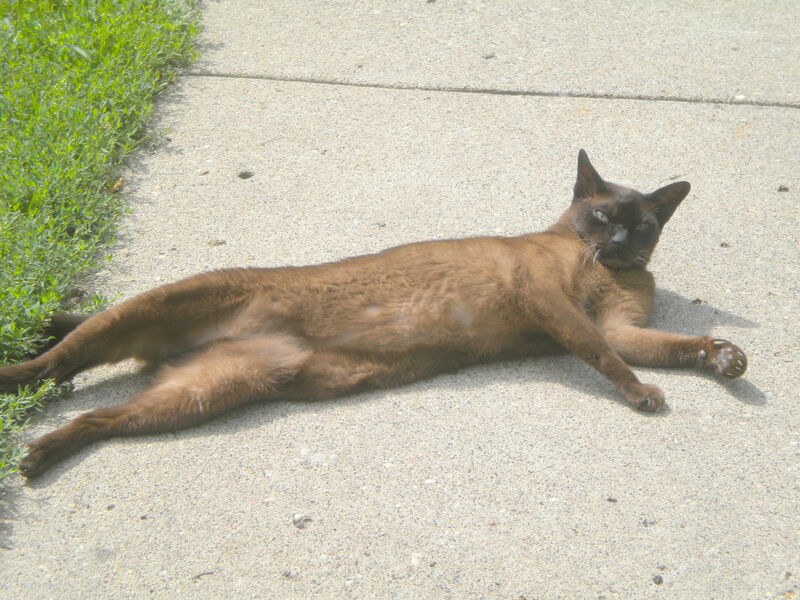 Bela, a Tonkinese whose demise under the wheels of a car came way too soon, but in a short lifetime epitomized Alpha Pizzazz. Rammy, a long-ish haired Siamese, who brought all the spoils of his night hunting to the door of our cabin in Big Sur, carefully laying out the feet and tails in a line. Ram’s happy “burrrupp,” trilling upward to a focus on the final “p,” still elicits laughter and tears. He shared the house, at that time, with Neferkitty, a sweet black Burmese who had been brought to submission and rescued from children who liked to play doll dress-up. With her. Then there was Magic. 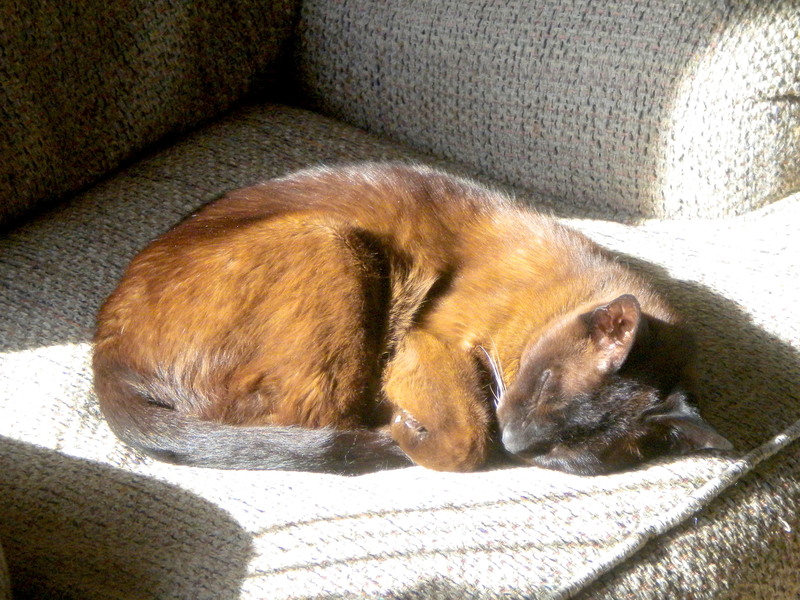 Another Tonkinese who ruled both our hearts and his world with his magnificence. And Esmeralda Paranoia, a sweet Siamese who adored her brother/house-mate in spite of the fact that the feeling wasn’t mutual. Cosmo came next and was briefly joined by Button, a feral outside calico who regularly pressed her nose against the outside door – wanting so to be in, but fearing to join. And then, for too brief a time, with Lyra Deara, my darling dark foundling girl who one day, suddenly became paralyzed. Many years ago our housemates included Pandora, a Siamese who eventually succumbed to cancer and died in my arms as the vet administered the fatal shot. And Robin Goodfellow, a big red who liked to dance jigs upon the dining room table and eventually got out into the big world and disappeared. They have all been splendid additions to our life. Each in their way. And we have, and still grieve their absence. Yet Cosmo is different. Not a “pet.” But one of the three of us. He has always come running when called. Loved to play “fetch” when I threw a wadded up piece of paper, bringing it back and dropping it at my feet for another round. Reveled in games of Tag, sneaking around the furniture only to run out and swat me with a tag, running to hide, waiting for me to sneak up and swat him. If I get up from the bed in order to go to the bathroom, he comes along, waits, and accompanies me back to bed. He understands words so that we have to spell things like “T-r-e-a-t,” so he won’t run and stare at his dish unnecessarily. Or “B-a-d C-a-t,” which will make him rum and hide after hearing the embarrassing epithet. These days he prefers to snuggle under my arm or against my side, and I know he grieves and worries whenever we’re gone. He often sighs. Deeply. And at an appropriate time. And now he has had a stroke, according to the vet. One week ago we awoke to his cries and watched him stagger and flounder across the floor, flailing right then left. All that night we watched and fretted as he threw up repeatedly and cried and flailed some more. Now his movement is improved but he is not always here, walking down the hall only to stop as if he is wondering where he is and why. He looks at us in the same manner as if he is wondering who we are. And why. He moves aimlessly from window cushion to the bed, from upstairs to down, from sleep to agitation. We can’t ask him if he is in pain. In distress. In deep depression. I have always believed that we are our “pets” gods. That it is up to us to make that final (heart-rending) decision. And now I am conflicted. Now, we’re waiting and watching. This entry was posted in Cats, Family, favorite things, HEALTH. Bookmark the permalink. the lasts UU magazine had an article about a hospice for pets you might find the article helpful. How did this ever turn out? I feel like I’ve been away from you for forever. I hope the cat’s okay. We are servants of two cats, one big tom who thinks he’s a rock star and the other young kit who still likes to play. When I get up to go to the restroom, apparently I am suspected of being incompetent to carry out this personal task, because first the kitten runs ahead of me, then I go, then the dog, who waits with a sigh outside the door. If I try to close the bathroom door, it hits the cat, who has stopped at the food dish. So it doesn’t close, which is fine with the dog, who will stick his head inside to check on me if I take too long! All this drama in a house that I thought would just be filled with boy’s laughter and the like. Nope, got animal agenda’s, too. They are special, are they not? Great post!